Am I Truly “Privileged” Just Because I’m White? A Story Of Oppression From A White Woman With A Severe Disability. I am in tears as I write this. I didn’t sleep very well last night due to someone I thought I knew and I thought he/she knew me calling me a “racist” for not jumping onboard with the Black Lives Matter movement. I am also losing friends for this reason. In my original post regarding the recent two police brutality cases and cop killings, I said that “all lives matter.” You can find the link for the post and my follow-up post a little later in this post. When I shared my “All Lives Matter” post on Facebook A.K.A. “Hatebook,” I came across a meme claiming that the phrase “all lives matter” was created by white supremacist groups in opposition to Black Lives Matter. I should have known better and researched it before writing my follow-up post where I apologized but explained that I truly mean it when I say all lives matter. But my emotions took over and I didn’t investigate it. After calming down, my husband looked it up and discovered that “All Lives Matter” was NOT created by white supremacist groups! He made the observation that wouldn’t white supremacists say, “White Lives Matter?” After all, they hate everyone who isn’t a white Anglo-Saxon Protestant — “WASP.” Yes, we know them best for going after black people, but they hate everyone else too. Sure enough, there is nothing to show that “all lives matter” is from a white supremacist group. In fact, black people say it too. “In the discussion surrounding “Black Lives Matter”, the slogan “All Lives Matter” is sometimes used as an alternative. Its supporters include Senator Tim Scott. According to an August 2015 poll, 78% of likely American voters said the statement All Lives Matters was “close[r] to [their] own” than Black Lives Matter. Only 11% said the statement Black Lives Matter was closer. Nine percent said neither statement reflected their point of view” (https://en.m.wikipedia.org/wiki/Black_Lives_Matter#.22All_Lives_Matter.22). “Then two members of the U.S. Commission on Civil Rights — speaking as individuals, not for the commission — wrote to the dean. This makes American University look foolish. While we know that President Obama has stated that ‘all lives matter,’ we are not personally aware of any cases in which white supremacists (a rare species these days) have made that statement. (Obama, in explaining why he does not think the phrase ‘Black Lives Matter’ is offensive and that he does not think the protesters are suggesting other people’s lives don’t matter, said in October, ‘I think everybody understands all lives matter’). If you Google “all lives matter,” the only thing you’ll see is people arguing about it and criticizing people who use the phrase. SAD!! An inclusive phrase being ripped apart. Anyway, note to self: always research stuff before taking it as “fact” when you see it on Facebook. I want to make it very clear that I support all black people. All my life I have been aware of how unfair the world can be by judging people by appearances in the way some whites will look at a person’s skin color and falsely and automatically assume bad things about them. But I just can’t support the group Black Lives Matter. I don’t believe that they’re representatives of the race, and sadly, they are hurting race relations through their behavior. Many black people do want peace and love. They even peacefully protest. However, Black Lives Matter seems to draw unstable radicals who cause a great deal of death and mayhem. I also feel that Black Lives Matter dismisses other minority groups that have been oppressed and horribly treated throughout history and into the present. What about the Jews and the Holocaust? Recently anti-semitism has come back. What about the Native Americans who were murdered and now live on reservations? To understand where I stand with the recent police brutality cases and the cop killings, see here and here. The reason why I am so upset that I was called a “racist” is because I clearly condemned all violence and all racism and bigotry in my posts! Also, this person said that I have “white privilege.” To be honest, I don’t feel like I have much “privilege” at all because my family and I have had to fight for everything I need and I am still fighting. My life, while blessed in comparison to many, is anything but easy. c : an irrational attitude of hostility directed against an individual, a group, a race, or their supposed characteristics” (http://www.merriam-webster.com/dictionary/prejudice). b : prejudiced or prejudicial outlook, action, or treatment <racial discrimination>” (http://www.merriam-webster.com/dictionary/discrimination). Sometimes we must make sure something is good by discriminating whether a fruit is fresh or not. But when it comes to human beings, we need to stop being prejudiced and discriminatory based solely on their outward appearance. And I have never understood why white people think they are better than others simply because they are white. This problem with any and all people thinking they are supreme over others just confuses me. Of course, it’s especially apparent with children. Many adults of all races, ethnicities, and religions look down upon children and treat them as property. And black people are rightly upset because throughout history other people have been prejudiced against them and have discriminated against them based solely on their skin color . This ongoing prejudice and discrimination is SO WRONG! However, before anyone calls someone like me a “racist,” you need to walk a mile…Oh wait, I can’t walk, so it’s more appropriate probably to say… Roll a mile on my wheels. Let’s look at my reality for a moment since I have been looking at everyone else’s. 1. When I was born in 1981, I didn’t breathe for forty minutes. The doctors wanted to give up on me, but my dad almost had to punch the doctor so they wouldn’t stop working on me. It literally saved my life. I am a miracle. 2. Even after I was stabilized, the doctors still didn’t think I would live. My parents kept fighting for the best medical care I could get. 3. When my parents got me home and started raising me, they quickly saw that I wasn’t developing as a typical baby should. I rolled over and army crawled but I couldn’t sit up, crawl, or walk. I couldn’t always hold my head up in certain positions. I couldn’t control my arms and legs much. My parents had to go from doctor to doctor to figure out what was “wrong” with me. Finally at around 18 months, I was diagnosed with Cerebral Palsy. After the diagnosis, they said that I wouldn’t do much. 4. I believe that some people looked at me and assumed I wouldn’t do much with my life and told my parents to just put me in a “special school” or just “put me away” as institutionalizing children and adults with disabilities was still happening in the 1980s. Heck, it’s still happening today in many parts of the world. Thankfully, my parents kept me and helped me to do the most I physically could such as hold my head up as much as I could, talk even though it was slurred, and use my hands a little. They saw that I wanted to do stuff and helped me to do things. They taught me that I could be like everyone else despite my severe cerebral palsy. 5. My family was in the working class. Both of my parents had to work to make ends meet, which meant fighting for all of the services and equipment that I needed that they couldn’t afford to provide for me. I often heard them fighting the school district for a full-time aide to be with me at school to both help me physically with my schoolwork as well as take care of all of my physical needs at school. They also had to fight the school to make sure I received the physical, occupational, and speech therapy that I needed. School officials would look at me and assume I wasn’t able to even be in the regular classrooms so I had to prove that I could be in a regular classroom instead of in the secluded special needs class. In third grade I was finally mainstreamed into the regular classroom full time. Then my parents had to fight with my teachers to cut down some of my homework or give me extra time to get it done because it took me longer than typical children to do my homework either by dictating the answers to someone or to type it up when I taught myself to type with my nose at the age of nine. My parents always had to fight to get me the adaptive equipment I needed such as wheelchairs, “potty” chairs, and bath chairs because the insurance companies never wanted to cover any of that stuff and it is very expensive. All this fighting went on my entire childhood. Nothing came easily for me! In eighth grade, my parents fought for me to get my first speech augmentation device. Again, these are very expensive and insurance companies don’t cover these most of the time. 7. Being in high school was even worse because on top of the friend and boyfriend situation, even my personal aide looked at me and assumed the worst about me. She told me that I would never go to college, get married, have the career I wanted, have children, and was destined to live in some group home. 8. Throughout my entire life I have always been the person with the most severe disability in pretty much every situation. I am the “Guinea pig” because I was so physically disabled that teachers and others didn’t know how to deal with me. But I always enjoyed proving people wrong. I truly hope that I have helped pave the way for other people with disabilities to be successful. 9. This means when I went to college, some of the professors had their doubts about me, assuming that, because of my appearance I couldn’t successfully complete the early childhood education program. Again, I had to prove myself and work hard to be at the top of my class, which I did throughout college and graduate school. I also had to prove that with the right help, I could work with children. They quickly saw that the children warmed right up to me. Now you might think I’m done with fighting since I am married, educated, and an author. If so, you are absolutely wrong! It’s been two and a half years since I graduated with highest honors from grad school and while fellow graduates of all races and ethnicities have their careers and families firmly established, no matter how hard I try, I haven’t been able to to break through closed doors in order to firmly establish my career so that my husband and I have income and can have a child before we get too old. I just started noticing that some people do avoid me at my book events. As a teen, that was the way it was because I wasn’t “cool” and “like everybody else,” so only those who took the time to get to know me hung out with me. This was extremely difficult for me as a teenager. I had thought it had gotten better in college and grad school because most were happy to talk with me. But since my book has come out, I’ve had a number of book signings in my area with only a couple people showing up. At first, I thought it was because my book is about gentle, respectful parenting. 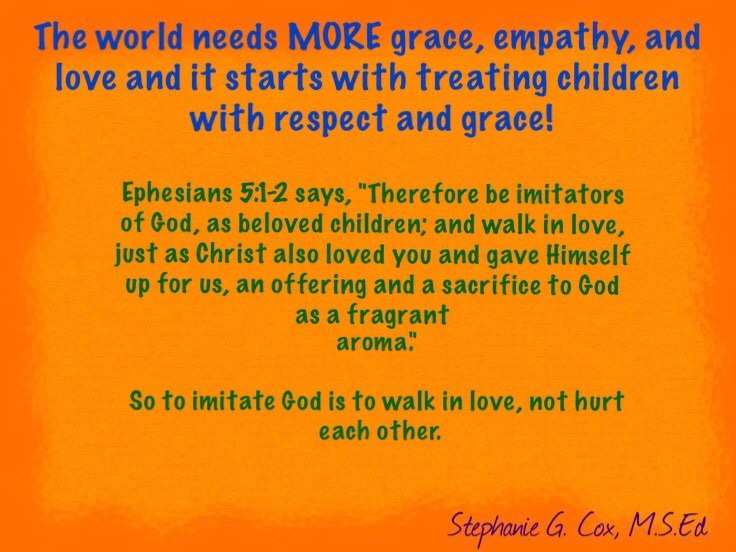 Corporal punishment is so ingrained in our society, especially Christian society, that it can be very difficult to get people to see that God never intended for children to be spanked/hit. But, after a recent book event where some people seemed to go out of their way to avoid me, it became obvious that it is more than just the content of my book. I’m sure there are other reasons why some people don’t approach me. I do feel, after being more in the public eye, some are afraid of me or intimidated by me. How does this make me feel? I’m fighting back tears as I type this. It hurts. It makes me angry. It makes me sick. Christians, I feel, should be the most accepting of me. Yet, at a Christian bookstore, Christians seemed to go out of their way to avoid me. 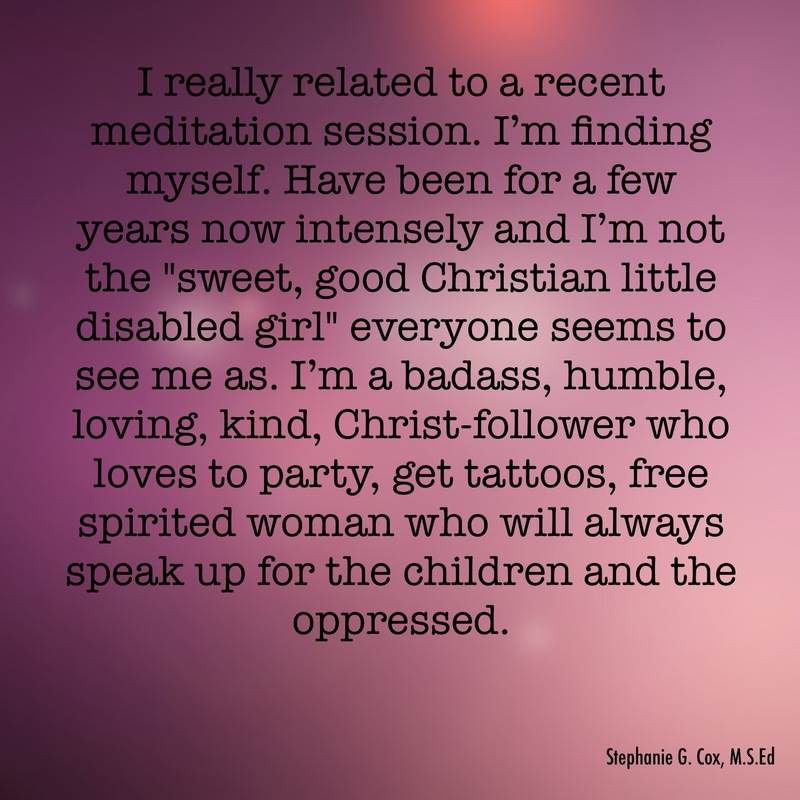 But, God is using my disability for His GLORY! I am not being punished. My parents are not being punished. God needs me exactly how I am to do His work for Him which happens to be advocating for children, the least of these. Read John 9 for a better understanding of how God can and does use people with disabilities for His glory. Please come talk to me. Ask me questions. I love talking with people. I love answering questions. My husband is always with me to help people understand me. Please don’t go out of your way to avoid me. This is an excerpt from the interview I did with my friend on September 1, 2014. Please click here to read the entire interview. Why am I telling you all of this? It’s definitely not to get pity! I truly hate pity! But I want people to understand, especially the people who call me “racist” and “privileged,” to see that I know hardship all too well. I know what it feels like to have people look at me and decide things about me, negative things about me, just based on my outward appearance. While I don’t have to worry about being pulled over by a cop for no apparent reason just because I’m black and facing the subsequent possibility of being beaten or killed due to police brutality and/or racial prejudice, I know I will never know what it is like to be a black person. But that’s where it ends because I’ve been called names, I get stared at, I get avoided, I’m not where I would be in my life if I wasn’t disabled. Able-bodied people will never understand what it’s like to be disabled. Believe it or not, people with mental disabilities were used in slavery. If they weren’t useful, they were thrown away in institutions where care was not high quality at all. Due to this, people with disabilities had shorter lifespans. I don’t feel “privileged” because money is very tight for my husband and me. We drive a 20-year-old van that is dying and unreliable but we can’t afford a new (to us) van that my wheelchair will fit in, and people had to pitch-in so we could afford to buy me a new wheelchair, for which I am very grateful! I don’t get welfare or disability because for some reason we don’t qualify for it. My husband stays home to care for me 24/7 as it is extremely difficult to get reliable help for me, which is why I work so hard to find my place in my field. Nothing comes easy for me. Yet, I feel like I have been crying out and protesting to the world that #peoplewithdisabiliteslivesmatter all my life through the way I’ve been living and fighting to prove people wrong. I feel that if I were to instead scream that “People with disabilities lives matter,” and complain about how bad people with disabilities have it that it wouldn’t show the world they’re wrong about me. It would only turn people off. It may even make some angry and not want to help or get involved. It may even make unstable people want to hurt and murder us even more. Children with disabilities are very likely to be abused. I was abused! Actions speak louder than words, and because people look at me and assume I have nothing to offer, I do my best to live my life in a manner that educates and inspires. I’m almost finished with a children’s book about my cerebral palsy to educate children on how to treat people with disabilities with respect. And I have done interviews with my friend to educate others about what life with cerebral palsy is like. Another thing is that TV shows and movies rarely have people with severe disabilities on them. Usually it’s either someone with Down Syndrome, Autism, or a person in a wheelchair that has upper body control. Every other minority group is regularly featured in tv shows and movies which is great! But! Finally, this fall on ABC, there will be a show with a boy with severe cerebral palsy!! What’s even better is the boy actually has severe cerebral palsy!! The show is called Speechless. I cried for joy when I found this out much like black people must have when finally they were featured in TV shows and movies. But wouldn’t you know it that some ignorant person already put down the show because it will “normalize” “the disabled” and not make us want to cure them. Hate and ignorance is everywhere! As excited as I am about the new show Speechless, it’s also important for me to point out that I don’t focus solely on advocating for cerebral palsy. Anyone following me for any length of time knows that my passion is advocating for all children. And when I do share things about disabilities, it’s about all types of disabilities. I do not feel any disability is more important than the other. No matter what your race, ethnicity, religion, sexuality, gender, age, or disability, if you group people together and label them in a negative manner, that is wrong. All are equal. All matter! All deserve to be heard! All need a voice! But let’s do it in a way that gets more people to listen and want to empathize. So I do understand why blacks have had it with the fact that people will look no deeper than the color of their skin and assume incorrect things about them. Bad things. They will assume that they’re thieves, thugs, criminals, or worse based upon their skin color. But the way to prove the world wrong about their assumptions isn’t by yelling, rioting, killing, beating, insulting, and destroying property. Such behavior only serves to reinforce the negative stereotypes and inaccurate assumptions about black people. Love and peace is how we prove people’s assumptions about us wrong and enact change.